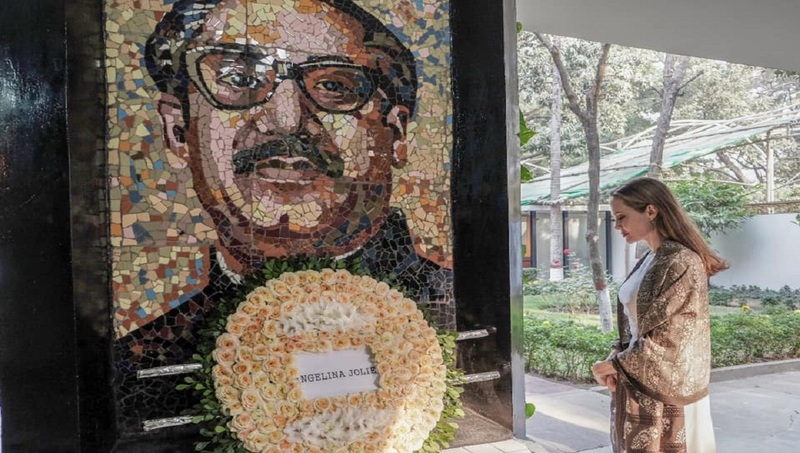 Dhaka, Feb 6 : UNHCR special envoy and renowned Hollywood actress Angelina Jolie visited Bangabandhu Memorial Museum at Dhanmondi in the city on Wednesday and paid tributes to Father of the Nation Bangabandhu Sheikh Mujibur Rahman. Jolie paid the homage placing a wreath at the portrait of Bangabandhu in front of the museum at Road-32. She was briefed about the history of the Father of the Nation and given the tour of the museum by the grandson of Bangabandhu and trustee of the Father of the Nation Bangabandhu Memorial Trust, Radwan Mujib Siddiq. CEO of the Bangabandhu Memorial Trust Mashoora Hossain, Secretary of the Foreign Affairs Ministry’s Maritime Affairs Unit (MAU) Rear Admiral (retd) M Khurshed Alam, officials of the UNHCR and the Foreign Affairs were also present. “I am deeply moved to be in the very special house…,” the UNHCR special envoy wrote a message in the visitors’ book of the museum. She, according to a press release, also stated that she is humbled and inspired while she found the museum adorned very well. Angelina Jolie came to Bangladesh on a special visit to the camps in Cox’s Bazar for the forcibly displaced Rohingyas from Rakhine, Myanmar currently sheltered by Bangladesh. On Tuesday, she urged the world to keep up the pressure on Myanmar to guarantee the rights, dignity and safe return of the Rohingyas and stand beside Bangladesh, which she commented cannot bear this pressure alone.